Digital workflow allows more information to be shared among clinicians more efficiently than ever before. Informatics advances have been a boon to radiology, but with growing data repositories spread across the health care enterprise, and by extension the entire health care system, radiologists may soon be dealing with too much of a good thing. Managing the increasing mass of data will require a new approach. The use of informatics tools has increased productivity significantly in the past decade, and new analytics and data mining applications offer the promise of better quality care but, as data and image sharing become more tightly woven into the fabric of health care, radiologists will need to develop a more global mindset. Gary J. Wendt, MD, MBA, a professor of radiology and the vice chair of informatics at the University of Wisconsin-Madison (UW), says tools that assist with peer, resident, technologist, and protocol reviews as well as scanner image quality offer good value to radiology departments. But he sees a need for a more cohesive approach to informatics. 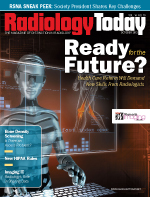 Rather than simply considering how a tool may help radiology, he says developers should be thinking about how it can be used by other departments as well. In other words, common functionality is the new black. Wendt cites a peer review tool developed by UW’s radiology department and integrated into its PACS. The tool soon drew attention from other departments that were interested in putting it into the EHR for other clinicians to use. Wendt says these types of projects increasingly are becoming necessary. With numerous departments relying on medical images and information from EHRs and various other departmental repositories, accessibility is no longer a perk; it’s a requirement. Data analytics and data mining tools can process more data than ever, but presenting that data in a form that’s easy to use is a work in progress. The ultimate goal is to have a single interface that can be used throughout the enterprise. Radiology is well positioned to participate in the process. Wendt points out that radiology has been fairly successful at aggregating data, moving from separate repositories for CT, MR, and CR images to today’s PACS. The expertise that’s been developed for moving images should translate well to other informatics endeavors. But it’s not going to be easy. Departments as disparate as pathology, dermatology, cardiology, and orthopedics have specific needs that will have to be addressed. Radiology likely will be in the middle of the effort, but it will have to think about informatics with a less radiology-centric perspective. Sharing images is one thing, but scanning and viewing entire pathology slides or presenting gene sequencing in a visually useful format are problems that people are only beginning to mull. There still are many challenges that need to be addressed before the numerous large silos of medical data coalesce into a connected enterprise tool. Paradoxically, although there’s plenty of data, there’s a need for more searchable, mineable data. Wendt says systems that automate and standardize data storage will be crucial to these efforts. Currently, analytics and data mining are targeted to specific clinical and administrative questions because there’s not enough standardized data for general inquiries. Because of the lack of standardized data, analytics and data mining largely have been used for research, but Wendt thinks applying the tools to the clinical point of care will speed up their development. He sees the true value of this technology as a real-time adjunct to clinical care. For example, a tool that does some preprocessing of a patient’s data potentially could provide useful clinical information without being queried. Such a system may provide alerts about items in a patient’s medical history that are relevant to the symptoms but may not have been communicated by the primary care physician. Or it may provide some decision support for certain image sequences. — David Yeager is a freelance writer and editor based in Royersford, Pennsylvania. He writes primarily about imaging informatics topics for Radiology Today. Great Valley Publishing Co., Inc., 3801 Schuylkill Road, Spring City, PA 19475 | Copyright © 2019 All rights reserved.